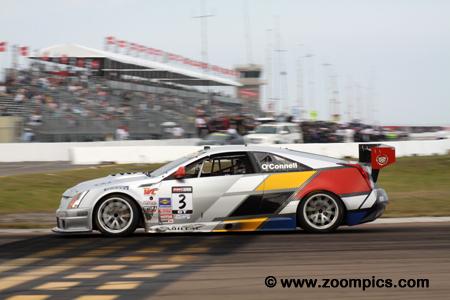 In 2013, the World Challenge Championship kicked off its twenty-fourth consecutive season at St. Petersburg, Florida in March as a support event for the IndyCar series. The season ended the first weekend in October at the Grand Prix of Houston. In between these two events, there were races at Long Beach, Circuit of the Americas, Detroit, Lime Rock, Toronto, Mid-Ohio and Sonoma Raceway. Grand Touring (GT) – This group includes the series quickest cars: Porsche 911 GT3, Chevrolet Corvette, Dodge Viper, Cadillac CTS-V.R, Nissan GTR, Audi R8 LMS and Volvo S60. The preparation rules remain unchanged from the previous year. These vehicles produce more than 450-horsepower. Grand Touring Sport (GTS) – The cars in this class are not permitted the same level of preparation as the GT category. The class is a mix of cars that could be best described as sports cars or sports sedans. Vehicles eligible to compete in GTS include SCCA Club Racing Touring 2 cars and some FIA GT4 cars. Makes competing in this category include the Ford Mustang, Porsche Cayman S, Chevrolet Camaro, Kia Optima and Acura TSX. Touring Car (TC) – The preparation of the Touring Cars is closely aligned with Grand Am Cup and the Sports Car Club of America’s Improved Touring classes. The wide range of vehicles homologated for this category mean that power output ranges from 180 to 260-horsepower. Also, there is significant variation in drivetrain configurations – front-wheel, rear-wheel and all-wheel drive. Makes competing in the category include the Honda Civic Si, MAZDASPEED3, Volkswagen Jetta and Golf. Touring Car B (TCB) – World Challenge’s newest class was implemented to allow competitors to race at the professional level in cost-efficient cars. To keep expenses down, modifications are limited to performance spring and shock packages offered by the manufacturers. Makes competing in TCB are the Kia Rio, Honda Fit, Mazda 2, Fiat 500 and Mini Cooper. 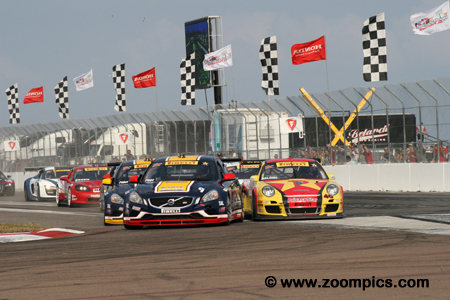 The 2013 Pirelli World Challenge Series opened with the St. Petersburg Sports Car Challenge presented by StopTech. Forty-two Grand Touring and Grand Touring Sport drivers competed in two fifty-minute races around the fourteen-turn 1.8-mile temporary street course. 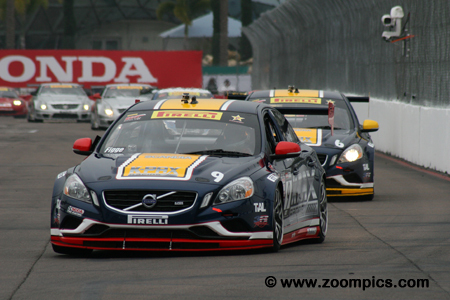 Round one of the Pirelli World Challenge series at St. Petersburg and the pole-sitter, Alex Figge driving the K-PAX Racing Volvo S60 leads the field of sixteen GT competitors into corner one. Immediately behind Figge is the second fastest qualifier and his K-PAX teammate, Randy Pobst. Pulling alongside Figge is the third-place starter, Ryan Dalziel in the No. 46 Porsche 911 GT3. Ryan Dalziel qualified third for the season’s first event driving a Porsche 911 GT3. 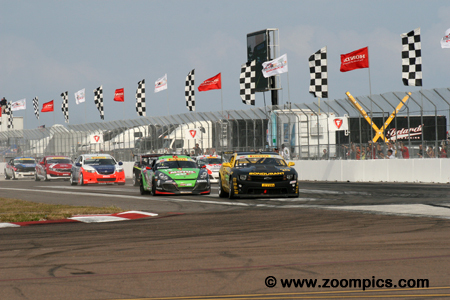 In Saturday’s race, Dalziel moved into first place and took the victory when the race leader, Alex Figge went wide in corner one. However, the car’s splitter failed the post-race technical inspection – Dalziel was excluded from the results. His disqualification meant he started at the rear of the field for race two – a flat tire caused him to finish sixth. 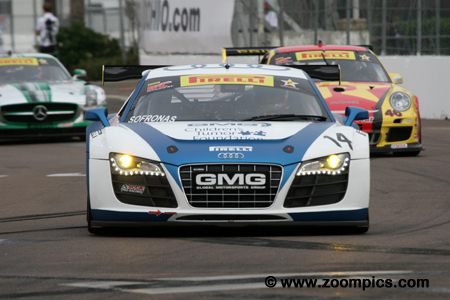 Sports car veteran, Jack Baldwin scored back-to-back GTS wins at the St. Petersburg Grand Prix. 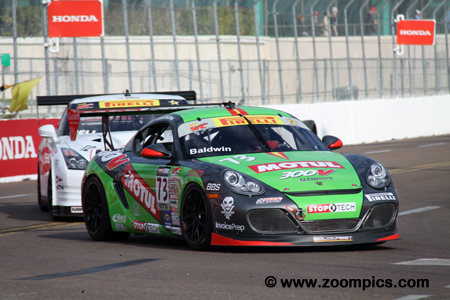 Driving the Motul/StopTech sponsored Porsche Cayman S, Baldwin started Saturday’s contest on the outside of the front row. A last lap pass on the class leader, Andy Lee gave him the victory. The following day, Baldwin was gridded first. During the race, he was challenged by Lawson Aschenbach but held on to win by 0.029-seconds. During the off–season, James Sofronas switched brands moving from Porsche to an Audi R8. It appeared that the change agreed with Sofronas. In the weekend’s first race, he qualified fourth but problems for Randy Pobst and Ryan Dalziel give him the runner-up spot. On Sunday, Sofronas started on the pole but dropped to fourth. Again, the Audi’s reliability paid off and this time he took the GT class win. K-PAX Racing entered two Volvo S60s. The No. 9 entry was driven by former open-wheel racer, Alex Figge. Figge’s 2013 season could not have started any better – he started on the GT pole and won race one when Ryan Dalziel was disqualified. However, Sunday was a different story. Figge was leading when he had to pit for a flat tire. After it was replaced, he returned to the race and finished thirteenth. 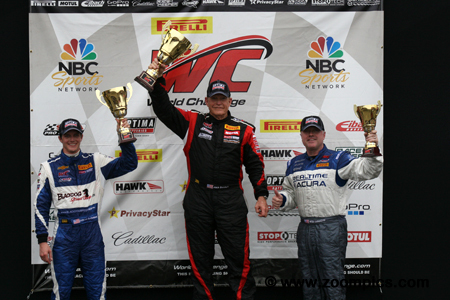 The 2013 round two Pirelli World Challenge Grand Touring podium. In the center is the winner from the Global Motorsport Group, James Sofronas. Sofronas’ victory on Sunday and his second place finish on Saturday gave him the class point’s lead. 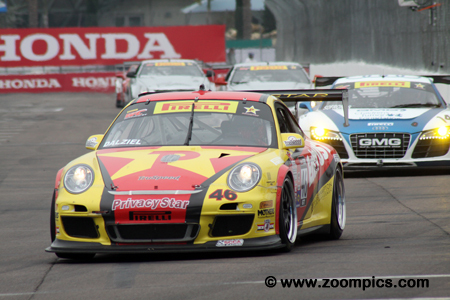 On the left is the runner-up and four-time GT class champion, Randy Pobst. Completing the rostrum is another World Challenge GT champion, Johnny O’Connell. Gridded behind the GT class for the start of the season’s first race were the GTS competitors. Leading the field of twenty-six drivers into the first corner is the pole-sitter, Andy Lee driving the Best IT sponsored Chevrolet Camaro. Behind Lee, is the second fastest qualifier, Jack Baldwin in the No. 73 Porsche Cayman S.
In race one, series veteran, Peter Cunningham qualified fifth. Cunningham, driving the No. 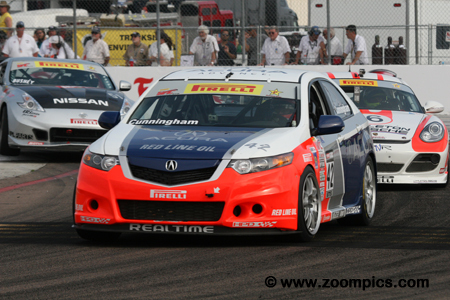 42 RealTime Racing prepared Acura settled into fourth place during race one. An aggressive pass by Kevin Gleason on lap-32 resulted in contact with Lawson Aschenbach. Aschenbach spun and Cunningham inherited a third-place finish. On Sunday he repeated his performance – started fifth and grabbed the final spot on the podium. Lawson Aschenbach had earned Pirelli World Challenge titles in TC (2011) and GT (2006). In 2013, Aschenbach was competing in the GTS category driving the No. 10 Chevrolet Camaro. He qualified fourth for the weekend’s first race and was running third when he was hit by Kevin Gleason - this caused him to finish fifth. Race two went better for Aschenbach – he started fourth and finished in the runner-up position. In 2012 Andy Lee won four GTS races and was named the class Rookie of the Year. Lee was strong at the St. Petersburg Grand Prix. 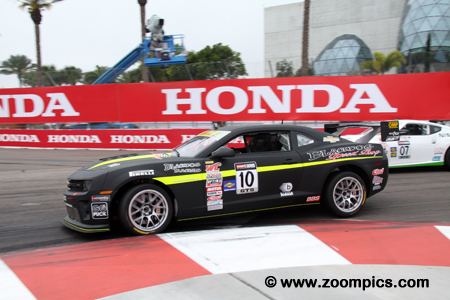 He qualified on the pole driving the Best IT Chevrolet Camaro and led the race until the final lap when he was passed by the Porsche of Jack Baldwin. On Sunday, Lee started second and battled with the pole-sitter, Baldwin until he pitted with a mechanical issue. Lee was classified twenty-first. Four-time GT class champion, Randy Pobst returned to K-PAX Racing for the 2013 season. 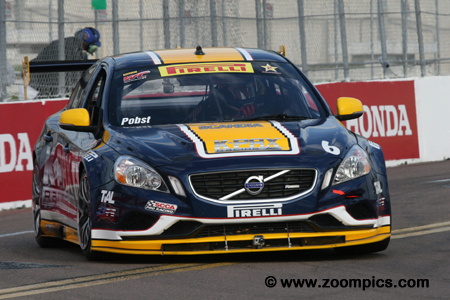 Driving a Volvo S60, Pobst qualified on the front row with his teammate, Alex Figge. A poor start in round one allowed Ryan Dalziel, James Sofronas, Johnny O’Connell and Andy Pilgrim to pass him – he finished fifth. 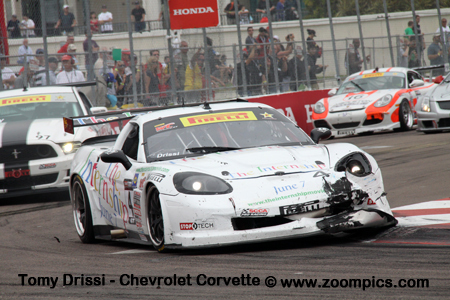 On Sunday, Pobst was second after battling for much of the race with the eventual winner, James Sofronas. 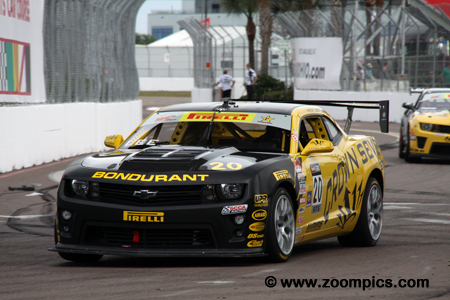 Defending Pirelli World Challenge GT champion, Johnny O’Connell drove the No. 3 Cadillac Racing Cadillac CTS-V.R. O’Connell was gridded fifth in the first race of the season and inherited a third-place finish when Ryan Dalziel was disqualified. On Sunday, he recorded the same statistics – started fifth and was in third place at the checkered flag. Kevin Gleason made his World Challenge debut at the 2012 Mid-Ohio event and grabbed a victory driving the No. 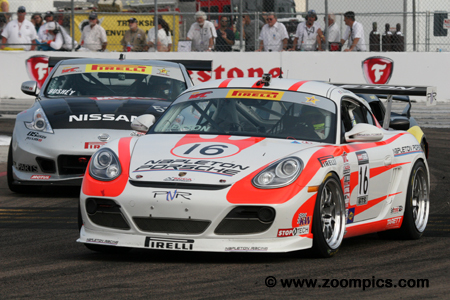 16 Porsche Cayman S. At St. Petersburg, Gleason was the third fastest driver in GTS qualifying. In race one, he was in fifth place when an overly aggressive move resulted in him passing Peter Cunningham and spinning, Lawson Aschenbach – Gleason finished fourth. He had the same results on Sunday. 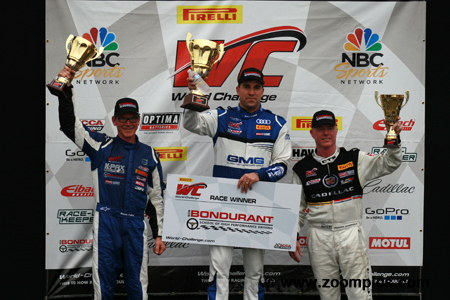 The second GTS podium of the 2013 Pirelli World Challenge season. In the center, is the victor, Jack Baldwin. This was Baldwin’s second win of the weekend. To the left, is the fourth place starter and runner-up, Lawson Aschenbach. Completing the rostrum is Peter Cunningham who recorded his 114th finish on the podium.